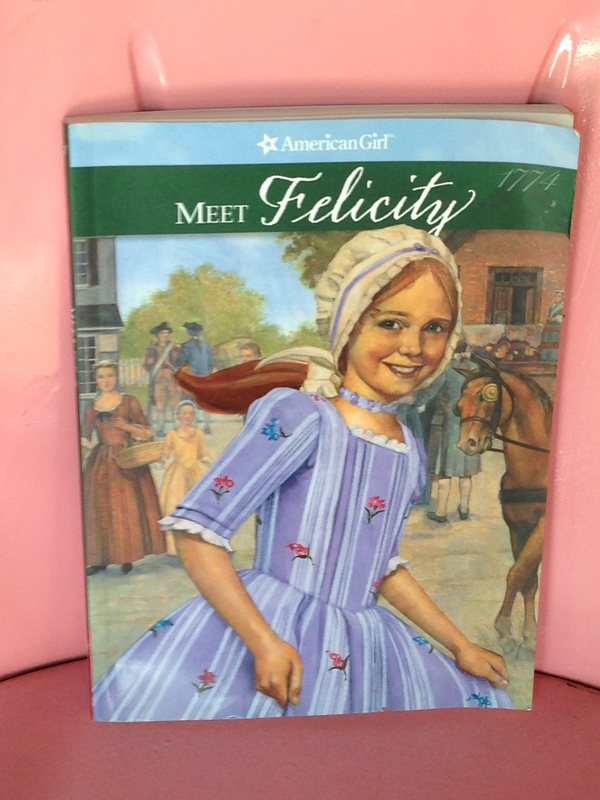 Meet Felicity is the first in the series of six books about this spunky nine year old girl. Her story is set in Colonial Williamsburg, Virginia in1774, right before the Revolutionary War. She is energetic, determined, kind and independent. Felicity’s forte is not handwriting or stitching, which both were valued skills. She loves being with horses, so that’s where she invests her energy. When she discovers Penny, a mare that is mistreated by a neighbor, she is determined to help her. Felicity focuses her energy and kindness into doing what’s best for Penny, even at the risk of her own self. In the process, she also strengthens her friendship with Ben, her father’s apprentice at their family shop, Merriman’s Store. Together, they are determined to free Penny from her cruel owner. In the end, Felicity rides Penny over the dilapidated part of the pasture fence to let her go free. “Penny galloped on, carried by the force of her jump, running, running toward the woods. But just as she got to the edge of the trees, Penny stopped and looked back at the pasture where Felicity lay gasping for breath. When we give someone we love what we value most and what’s best for him or her, we are a true friend. That’s what I want my young daughter to see from Felicity. Her kindness is worthy of imitation. F- How do you feel when you see someone be mean to animals and other people? What can you and your family do to help those that are not treated kindly? R- Even though you live 200 years after Felicity’s story, how do you relate or connect to her and her experiences? For example, how are you kind and helpful to others? How do you develop friendships with people and pets? . . .
I- Imagine you can be part of the adventure with Felicity. What part of the story do you want to experience most with her? Why? N- Navigate (map out) where you think the story is going to go next before reading the section titled “A Sneak Peek at Felicity Learns a Lesson”, the second book in this series. Answer questions like, Will Felicity see Penny again? What will happen in her friendship with Ben? . . .
D- Develop your historical knowledge of Colonial America in 1774 by reading the six page section in the book titled “Looking Back”, which includes: a map of the 13 colonies, pictures of Williamsburg and rural farms in Virginia from that period, dining customs and foods, and historical facts. S- Share the movie Felicity with your audience after reading the book series. Afterwards, discuss what was similar to and what was different from the book. Share what else you learned about the historical time period. Like Kidsbook Friends on Facebook to receive kids’ book titles with correlating crafts, questions, contests, activities, and reading tips to help your kids love reading this summer! 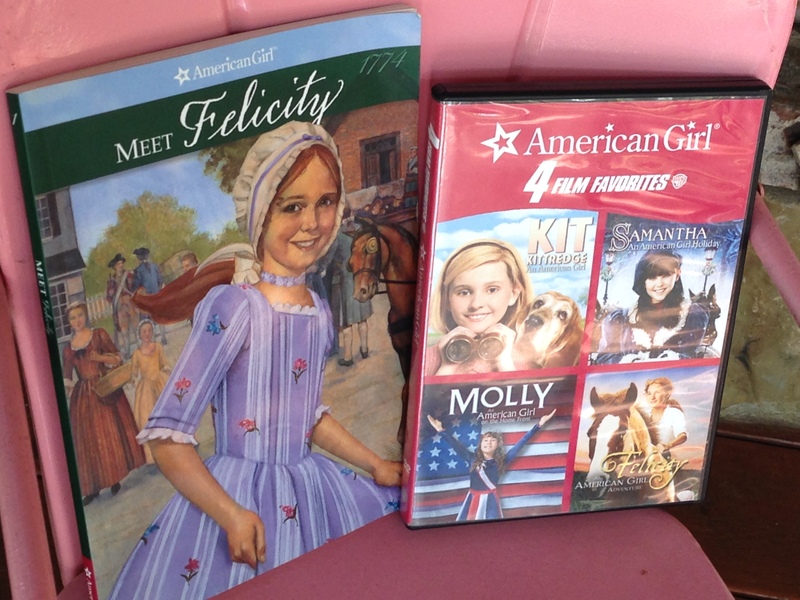 This entry was posted in America, Girls and tagged 1774, American Girl, Felicity, Meet Felicity, Valerie Tripp. Bookmark the permalink.